MORE NEW GAMES - IT’S A JUNGLE! 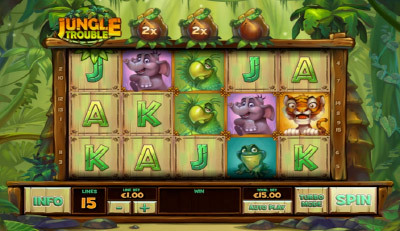 Jungle Trouble here at Fly Casino is a jungle themed 5-reel and 15-payline slot. Just like many slots that you play at Fly Casino, Jungle Trouble has a wild and scatter symbols. However, these scatters are what you want to see the most in this game as they trigger a free spins bonus AND increases a multiplier above the reels to add to your winnings! Three or more scatters appearing in any position on the reels will trigger free spins whereby you will need to choose between THREE different bonus features. #1 The multi spins mode allows you to use the coconut multiplier. Coconuts are placed above your reels and whenever a scatter appears under one of the three coconuts the multiplier grows. #2 You also have a high scores mode which plays only the highest playing symbols and the scatter and the wild during the spins. #3 You can choose the nudge wild mode. This means every time a wild falls on your reels, they will lock and then nudge down each additional spin. Get two or more scatters during free spins and get 3 extra spins. 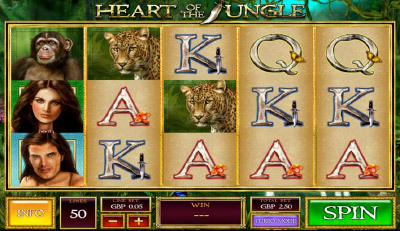 Heart of the Jungle is a 5-reel, 50-payline slot at Fly Casino that is theme around a Jungle. Game symbols include elephants, tigers, chimpanzees, parrots and many more. This is no standard free spins round whereby you can win up to 25 Free Spins with Stacked Wilds and Multipliers. You will get to play up to four levels along the Jungle Trail depending on how many times you have already activated the feature. Keep hitting the bonus feature and your game will save your progress for future game play. Bonus Feature #2. The ‘Achievements’ feature in Heart of the Jungle awards you a notification each time you collect a specific payout or trigger a bonus. Your achievements will be stored for you to review as you try to collect all 64. IT’S FUN AT FLY CASINO! Fortunes of the Fox is a 5-reel, 25-payline slot game themed at Fly Casino is cartoon style slot that takes place in the wild with a cute fox and his hound friend. This gambling game at Fly Online Casino takes you on an adventure of fun and winnings. Bonus #1 Bonfire Free Spins. 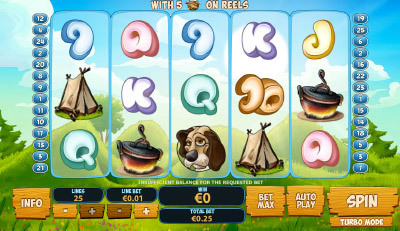 Get three Fox wilds anywhere on reels two, three and four and you will trigger the Bonfire Free Spins Feature. Get 15 free spins at 3X regular payouts. You can get more free spins by landing Wilds on the center reels and this re-triggers indefinitely! Bonus #2 Lucky Grapes Bonus Feature. The lucky grapes bonus is won when three or more Scatters land anywhere on the reels. The fox uses a trampoline to to grab bunches of grapes reveal bonus feature awards. BIG TUESDAY! From 00:00GMT until 23:59 GMT, all members are invited to follow the yellow brick road to receive a 166% bonus up to $/£/€166 on your first deposit of $/£/€ 30 or more.